The 2019 shutdown furlough began on Sunday, December 22, 2018, affecting about 800,000 employees who won't be paid during the lapse in appropriations. Approximately 95% of HUD's employees are not allowed to work during this furlough. Affected federal employees have been promised back pay once the furlough is over, but we're missing paychecks for now. Below is a list of resources, information, and sites for information about the furlough, HUD's plans, and financial, food, or well-being assistance. OPM's Furlough Guidance, and Shutdown Furlough pages. These include a link to a fact sheet with information about pay and benefits such as leave and health insurance, as well as OMB guidance. OPM also provides sample letters that you can send to creditors and mortgage companies if you are having trouble making payments due to the lack of a paycheck. Note that OPM recommends calling first before you send the letters. Impacts of the shutdown, prepared by Senate Committee on Appropriations. HUD 2018 Contingency Plan (90 pages long). Page 52 contains the furlough notice that covers the first 30 days of the furlough. Useful information related to the shutdown begins on page 56. OPM's information about your pay and benefits during the furlough. This contains useful information about what happens regarding your leave (you can't use any and furloughed employees won't accrue any when in an unpaid status for over 80 hours), health insurance (you are still covered), and allotments that are paid out of your salary such as child support or loan payments (not happening because you aren't getting a paycheck). Single parents can get help from Single Parents in Need (SPIN), according to AFGE. Contact Tamara Mandel, SPIN executive director, at 818-849-5910 (o) or 818-631-0069 (c), or see the foundation's website. AFGE has a list of banks that will work with federal employees having financial trouble. Many banks, such as Bank of America, are offering personalized assistance to customers affected by the shutdown. Wells Fargo and some other banks, are offering automatic assistance such reversal or waiver of late fees, insufficient funds fees, and monthly service fees. Fed Choice Federal Credit Union is offering reduced rate short-term loans, waiving withdrawal penalties, and providing other assistance during the shutdown. Navy Federal Credit Union is offering zero-percent loans to members affected by the shutdown who have their paychecks direct deposited into their NFCU account. For more information, see your bank's website or call your bank. UnionPlus offers assistance to union members and a $300 grant to furloughed or excepted Union Plus Credit Cardholders. The TSP (Thrift Savings Plan) will waive payments on outstanding loans during the shutdown without requiring evidence of nonpay status. Employees may continue to contact the Employee Assistance Program (EAP) during the shutdown 24 hours a day, 7 days a week by calling 1-800-222-0364 (888-262-7848/TTY) or visiting www.FOH4You.com. 211 will connect you to information about Health and Human Services assistance in your area. Call 211 and the call will go directly to the local jurisdiction, or find local services at 211.org. Cell phone companies including AT&T, Verizon, Sprint, and T-Mobile, will waive late fees for workers impacted by the shutdown and will work with furloughed employees on payment plans. Internet service providers such as Cox and AT&T are also willing to help if you have trouble paying your bill. "With the ongoing government shutdown, we don’t want our customers who are impacted to worry about losing their Cox services," says Cox on its website. AT&T similarly announced, "Just because the government shut down, doesn’t mean that your phone, TV, and internet should stop working too." Check your cable company's website or call them to say you are a government employee seeking relief. Food banks around the area are feeding federal employees who are short on funds. The Capital Area Food Bank is holding free pop-up grocery distributions at eight sites around the Washington area for government employees and contractors affected by the furlough. José Andrés is also feeding Feds. His World Central Kitchen has opened a pop-up kitchen and cafe to serve federal employees in need and their families at 701 Pennsylvania Avenue NW, and he is expanding his #ChefsForFeds effort across the country. In its first two days, #ChefsForFeds served nearly 12,000 meals. Andrés is also offering free sandwiches at his restaurants for federal employees with an ID. Other restaurants are also helping to feed federal employees. See a list provided by AFGE. Many websites, such as Bankrate.com, provide advice as well as links to help affected employees cope with the financial impact of the shutdown. 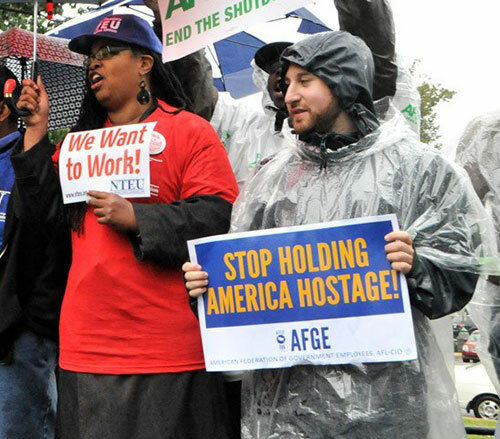 For further information, resources, and guidance on action you can take, see AFGE's Shutdown Hub. The Committee for a Responsible Federal Budget provides general, non-partisan information about shutdowns as well as links to more information. The 2019 shutdown could cost the U.S. economy over $6 billion if it is not resolved by January 25, the end of its fifth week, according to one report.